3 of our 12 ounce packages, freshly roasted and shipped - ground. Packed in foil bags with one-way valve for maximum freshness. Cup Characteristics: Our most popular coffee and for good reason. We blend Colombia Supremo and Kenya AA with Peru to make a complete, all around coffee. 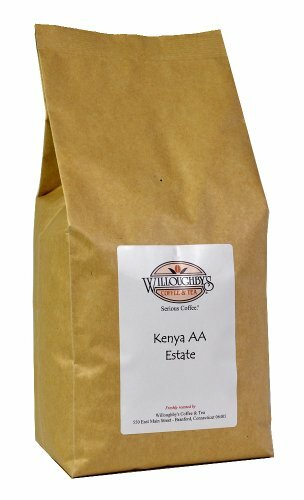 Our House Blend is mildly acidic and aromatic; the body is medium to medium/heavy. 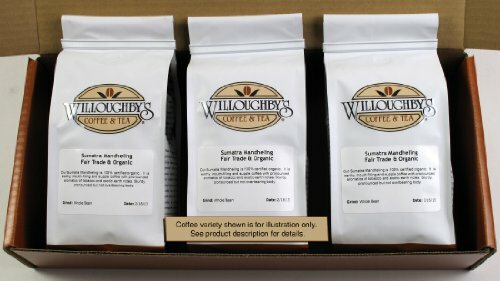 You will enjoy Willoughby's House Blend any time of day. 5 pound bulk package, freshly roasted and shipped - whole bean. Save 21% off our 1 pound price plus receive free shipping in continental US. Packed in foil bags with kraft finish and one-way valve for maximum freshness. Kianjiru is a small holder's farmers association that produces about 20 tons of high grown, quality coffee in the Southern slopes of Mt. Kenya in the central highlands just below the equator. Kianjiru is located in the Kirinyaga District at an altitude of 1750 meters, this area is known for its distinct high acidity coffee due to the rich volcanic soils and strategic location near a network of rivers. Cup Characteristics:Layered with notes of tobacco and lime with background of wild berry and rhubarb. Complex and tart, exotic but approachable.